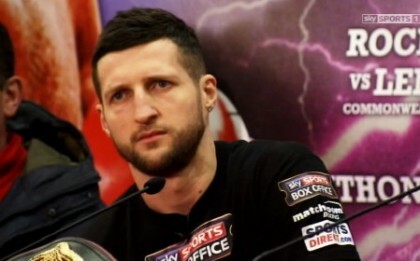 By Scott Gilfoid: IBF/WBA super middleweight champion Carl Froch (33-2, 24 KOs) is ready to vacate his IBF title rather than face his IBF mandatory challenger James DeGale next January in the UK. Froch wants a fight against Julio Cesar Chavez Jr in Las Vegas, Nevada. Froch says his promoter Eddie Hearn has been talking to Chavez Jr’s promoter about putting a fight together. I’m not sure if Froch is aware that Chavez Jr has said recently that nothing has been said to him about a fight against Froch, and that he’s a free agent now and no longer with Top Rank. A fight between Chavez Jr and Froch doesn’t seem to be in the cards. It’s a fight that Top Rank promoter Bob Arum wants, but it’s not something that Chavez Jr is talking about. He’s been talking about possible fights against Saul “Canelo” Alvarez and/or Floyd Mayweather Jr.
It’s really no big deal if Froch vacates his IBF title, because having that extra belt doesn’t mean much. The guy that pretty much every boxing fan sees as the No.1 fighter in the super middleweight division is Andre Ward. It doesn’t matter how many titles Froch collects. As long as Ward is still around, he’s the recognized champion in the division. The other champions are more like just regular belt holders, but they’re not considered the overall champion. It’s all good and well that Froch is ready to give up his IBF strap, but I think he’ll be giving it up for nothing if he doesn’t get a fight against Chavez Jr, which is what I see the case being. Chavez Jr does not seem at all interested in fighting Froch right now. You would like to think that Froch’s promoter Eddie Hearn would be aware of this, because Froch will be giving up his IBF title for nothing if he really believes that Chavez Jr is going to be fighting him next. Froch does have the option of fighting Gennady Golovkin in Las Vegas if he wants to take that fight, because Golovkin and his promoter Tom Loeffler would take a fight against Froch in a second. Golovkin is a big deal in the United States, and with his impressive record of 31-0, 28 KOs, he would be perfect for Froch. Golovkin doesn’t have any baggage weighing him down like DeGale does with his previous loss to George Groves. If Froch is going to turn down a fight against Golovkin, then he’s going to need to come up with some other excuse other than him not being popular or him having been beaten by Groves in the past.